Stamford Talk: Eat, Think, Drive, Blog! : I'd Hammer Out a Love- Between- My Brothers and My Sisters- Aaaaall Over this Laaaaand! I'd Hammer Out a Love- Between- My Brothers and My Sisters- Aaaaall Over this Laaaaand! I'm sad to hear about Mary Travers' death. I met her once and she was really kind. Cheers to her for making such inspiring music- and for marching for Civil Rights, which I didn't know. 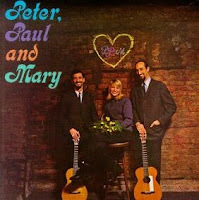 Mary, of Peter Paul and Mary, passed away at Danbury Hospital; she'd been fighting leukemia the past few years. My condolences to her family and friends. I love their music. I offer my prayers and condolences to the family.